These Ambiance Sprays will help you create your own personalized mood according to the scent you have chosen. These are the perfect size for travel! The Ambiance Spray is your perfect travel companion. 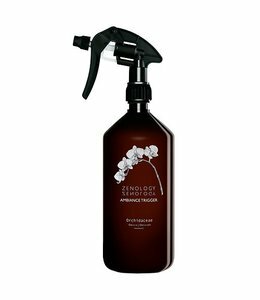 Spray it in your car, personalize your hotel room or refresh the locker room and experience the comforting quality of Zenology fragrances wherever you go. An Orchid bursting into bloom. Not only capturing the cheerful scent of its flowers but also the crispness of its leaves and the warmth of the earth it keeps its feet in. Hidden spices with tints of Mirabelle Plum evolves into a lush white floral heart while Beeswax and Sandalwood help to create a sensual finish.